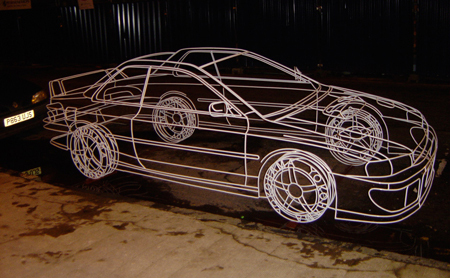 According to an interview published on Automobile Magazine’s site, British artist Benedict Radcliffe has originated a metalsmithing technique with which he welds wireframe models of full scale cars. His art is a unique contribution to welding as a creative process. The effect is as if the viewer is watching a drawn outline of a car speeding past in animated highlights. Radcliffe’s cars are a stunning example of how your welding skills can be used for artistic projects beyond the construction site. He uses nothing but steel rods as material for these sculptures, be they of Ferraris or Toyotas. In fact most of the welding equipment in his arsenal is like the products available at Sidney Lee Welding Supply of Georgia. The welds are accomplished by either TIG or MIG welding machines such as those manufactured by Miller welders. He crafts the entirety of each steel sculpture from a single gauge of steel rod, bent and then welded into intricate curves. Besides his ingenuity and dexterity, Radcliffe employs a secret gizmo to achieve the finessed steel bends that make his artwork look so lifelike. So while it might be difficult to match his style without apprenticing with him directly, at least you can draw inspiration from his finished masterworks. He does divulge that a lot of the detail emerges from careful line drawings extruded from the shape of the model car’s parts. Even though his use of welding equipment does not produce roadworthy vehicles, nonetheless his use of welding technique is profitable: his art has sold for upwards of $100,000 a piece. If you are a beginner welder or hobbyist artisan interested in creating welded car-art of your own, maybe it will be easier to start with any number of simpler DIY projects such as go-karts or bicycle frames. Start by searching the internet for the plentiful plans and schemes available on the web, and then come on down to your local Sidney Lee Welding Supply store in the Atlanta, GA area to find the welding supplies required to get your creative welding project done right!